Dude, you’re getting a planet! Hope you’ve got a ton of free time cause you’re gonna need plenty. If you have an iPad, get GodFinger. If you don’t have one, GodFinger is probably the most compelling gaming reason for you to get one. It’s like Farmville on Facebook in comparison. While GodFinger for the iPhone hasn’t officially been released yet (you can only get it in the Canadian iTunes store for now), the iPad version of GodFinger is here and its free. Part of ngmocos Freemium regiment, GodFinger brings you into the world of whacky and addictive gaming on your own planet on a spindle. You have followers. You put them to work for you. They farm and get you gold. They worship you and give you “Mana”. You take care of their needs (give them sunshine, rain and rest) and awe them. Mana is used to create things like rain, flood and sunshine. You buy upgrades in the Store with built up Gold and or Awes which gets you more followers. Rinse and repeat. As the game goes further you get goals assigned to you which you can finish to level up and get more XP. Impressing your followers is no easy task. You gotta take care of them. They moan, groan and whine, literally with cute little sound effects. Some of the whacky verbal cues remind me of Crazy Dave from Plants vs. Zombies with less humor. GodFinger actually has the most realistic 3D sound engines around. As you spin your planet the surround sound changes to match what’s in view and this changes depending on your zoom level. Graphics in GodFinger are made of sharp colorful 2D vector art. You can zoom all the way out to your galaxy or into the level of the earth and everything always looks perfect. The follower characters (both male and female) are fun to throw around too. You can actually toss them across the entire planet and get a count of the meters in this evil yet funny mini-game. Alerts and notices pop up throughout the game and you can close them out. Using its own Plus+ network, ngomoco has built in wonderful multi-player support for GodFinger on the iPad. You can link your friends to your surrounding planets and visit their planet for some added inspiration and perhaps ensued competitive motivation. Enchant their followers for points, send and receive gifts to/from them and a bunch more cool social messaging features are also built into the game. Push notifications tell you when you need to take care of your planet, harvest gold, and make rain etc. I had to turn this feature off because it got really annoying as the frequency of the messages was way too often, but it might be great for die hard GodFinger fans. Although GodFinger is free, you can go crazy spending all sorts of money on in-app purchases to pimp out your planet. I guess its also a way to give something back to ngmoco for the awesome work they’ve done with GodFinger. I would love to see GodFinger on other platforms perhaps the PC/MAC and even on consoles like PS3, and given that your user profile is alwasy stored on their servers, it should be very easy to do, although I’m not sure how you would go about buying stuff from the game’s store. Overall, GodFinger is a must have. Playing it will make you feel powerful and almost enlightened too, knowing how your life is perhaps a reflection of one of your followers in some way. 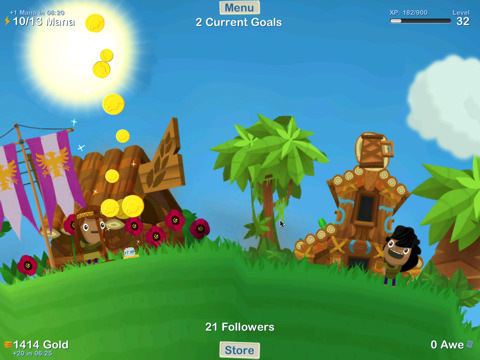 AppSafari review of GodFinger for iPad was written by Joe Seifi on May 13th, 2010 and categorized under App Store, Featured, Free, Fun, Games, iPad apps, Multiplayer, Resource Management. Page viewed 5827 times, 3 so far today. Need help on using these apps? Please read the Help Page. Hey there! anyone who can help me out!! ?